The Origin of Bread and the Phrase "The Best Thing Since Sliced Bread"
An idiom that is often used when something is new and fantastic is that, “It’s the best thing since sliced bread!” But how did this saying come to be? And what makes sliced bread so darn great? Our story begins about thirty thousand years ago, takes us through the town of Chillicothe, Missouri, and, then, to a futuristic ‘wonder’ful bread that is still on grocery store shelves today. Humans, and potentially Neanderthals, began grinding cattail, an edible plant that is still found in wetland habitats today, into flour approximately thirty thousand years ago. These humans realized that flour, chocked full of starch and carbohydrates, was a good source of energy and allowed them to be more mobile during their nomadic days. Additionally, cooking or baking the flour made the starch taste better. Researchers discovered this thanks to remains and traces of starch grains embedded in fossilized food preparation tools. The first man-made bread, likely, was unleavened, as in there was no yeast added. Today, we still eat certain types of unleavened bread, like naan, matzah, and flour tortillas. 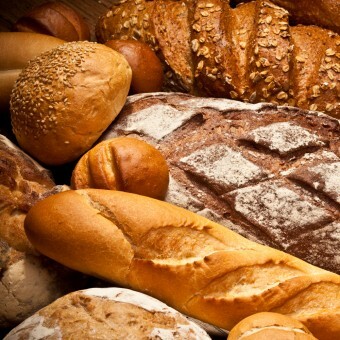 While humans didn’t understand the mechanism behind it, at some point it was discovered that if bread was left out in the open, spores of yeast, a naturally forming microorganism that floats through the air, would infiltrate the grains and make it “raise.” Leavened bread and the use of yeast in bread-making began sometime around four thousand years ago in ancient Egypt. In fact, archaeologists have found early grinding stones and baking chambers for yeast-based bread in Egyptian ruins, as well as drawings for thousands-of-year-old bakeries and breweries (see: A Brief History of Beer). From that point forward, bread and wheat became a staple in humankind’s diet. The domestication of wheat allowed civilizations to transition from hunters, gatherers, and nomads to farmers, growers, and urban dwellers. Bread was cooked in every household and was eaten at most meals. It came in all shapes, sizes, and consistency. For about five thousand years, bread-making was all done by hand, a necessary, but laborious practice. That is, until the industrial age. Stone flour mills appeared first in Europe at the turn of the 19th century and, then, in America in the 1820s and 1830s. The Erie Canal in the American northeast aided the transportation of this mass-produced flour. In fact, Rochester, New York earned the nickname “Flour City” because, within days of the canal opening, twenty flour mills began operations in Rochester, sending their product all over the east coast. Bread was no longer a homemade item, but produced for the masses as quickly, cheaply, uniform, and efficiently as possible. The first bread slicing machines, using parallel steel blades, appeared in America in the 1860s. However, pre-sliced bread sold to the masses didn’t come about until 1928 when a man named Otto Frederick Rohwedder of Davenport, Iowa invented a device to automate this process. He first built a prototype of his bread slicer in 1912, which didn’t interest bakers he showed it to as it was thought that no one would want their bread pre-sliced. Unfortunately, Rohwedder’s blueprints and machine were destroyed in a fire in 1917. From there, he struggled to obtain funding to begin again on his machine owing to the lack of interest. The primary concern was the reduction in shelf life of the bread. Rohwedder got around part of the staleness problem by wrapping the thinly sliced loaves in wax paper directly after slicing was complete. A back page ad on July 6, 1928 claimed it was the “greatest forward step in the baking industry since bread was wrapped.” Customers loved the convenience, reliability, and consistency of sliced bread. More and more bakeries wanted their own machines, including the Taggart Baking Company in Indianapolis. Alexander Taggart was a third-generation baker. Alexander’s father, after learning everything he knew about baking from his father while living on the Isle of Man (a small island in the Irish Sea between Ireland and Great Britain), immigrated to the US shortly after the Civil War. He opened his first bakery in Indianapolis in 1869, eventually joining forces with another baker, Burton Parrott, with whom they opened Parrott-Taggart Baking Company together. By 1898, they had sold and help found the United States Baking Company, which merged into the National Biscuit Company, aka Nabisco (changed their name to this in 1901). Within only a few years, Wonder Bread was America’s favorite bread. In 1930, Wonder Bread became the first mass-produced bread to be pre-sliced. This brings us back to “The best thing since sliced bread.” It is thought by most etymologists that it loosely stems from the aforementioned July 6, 1928 back page ad in Chillicothe’s newspaper (“The greatest forward step in the baking industry since bread was wrapped.”) and, later, Wonder Bread’s own constant hyping along a similar vein of its pre-sliced bread. The invention of sliced bread was yet another case where things humans used to do by hand were now being done by machines, making it significantly more convenient than ever before to make things like sandwiches (which gave rise to such things as the peanut butter and jelly sandwich- see: The Surprisingly Short History of the Peanut Butter and Jelly Sandwich). So what was the best thing before sliced bread? If you believe Chillicothe’s, it was wrapped bread, but that seems only a minor advancement. After all, whole loaves typically keep pretty well without being wrapped. Given how drastically bread helped change the way humans lived many thousands of years ago setting up so much of history, civilization, and the accumulation of knowledge since, it could possibly be said that machine-made, pre-sliced bread was the greatest thing since, well, bread. The sour taste of sourdough bread comes from lactobacillus, which lives in symbiosis with yeast, feeding on byproducts of the yeast fermentation. The sour taste itself comes from the lactic acid produced by the lactobacillus. This also helps the bread last longer without spoiling as most microbes can’t handle the acidic environment created by the lactobacillus. If you ever wondered where “Polly wants a cracker” came from, Nabisco had a more direct influence on that one. They originally released the saltine cracker in 1876. Their slogan for this new type of cracker was “Polly wants a cracker?” Saltine crackers were mildly successful after being released, but received a huge boost in popularity thanks to the Great Depression. Saltines were a nice cheap, tasty item to add to other foods such as watery soup, to make the meal more filling. Isle of Mann, not Man. @BB: Seems to be Isle of Man, not Mann. Several decades ago worked in a bakery and the standard question for purchased bread was “Sliced or unsliced”. Most saying originate from a similar popular saying. For example. Once they said “It happens”. Then it became “Sh*t happens”. So for “The greatest thing since sliced bread”, I think the author got it right – I always presumed it was “The greatest thing since bread”.